Policy letters are documents that declare a commander’s position on any given topic. 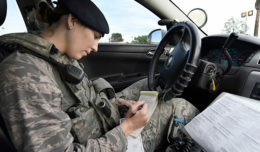 For example, your commander may produce a policy letter on physical training requirements, or a policy related to leave or off-duty activities. These policy letters serve the purpose of making the decision-making process simpler. Simply put, one doesn’t have to think quite so much because the decision has already been made. I’d like to submit that this idea of policy letters can be applied in our personal lives as well. When it comes to some of the major muscle movements of our personal lives, some policy letters can make life a lot simpler. Perhaps some personal examples would be helpful. I have a policy letter on marriage. It’s my policy, it’s quite simple and it has kept me between the ditches of life, and out of domestic court for the past 30 some years. Namely, I’m married thus I don’t cheat, I don’t even consider divorce as an option. We seek help when we need it from time to time. The policy letter, puts certain behaviors off the table. Decisions have been nailed down that reflect our faith and values. We have a policy letter on finances. Admittedly it took us a while to actually adhere to the policy, but when we do, we prosper, and when we don’t, we lose ground. Because of the policy letter, I don’t have to wonder if we are going to go into debt for a pizza, or a tank of gas by paying with a credit card and then carrying a balance. I don’t have to have a conversation with a car salesman about how much of a payment we can afford, because we don’t do car loans. The policy letter clearly states it. The decisions have already been made. Some other policy letter ideas? How about a policy letter on sports and extracurricular activities for the kids, or spiritual disciplines and religious life for your family, or family vacations? How about a policy letter on in-laws, or on parenting and house rules. How about a policy letter on how mom and dad argue especially when around the kids? The policy possibilities are positively prodigious. (Sorry I just had to say that). However, think how much simpler life could be if you already had these items sorted out in advance. Of course, there are some more serious policy letters you may want to consider. Like end-of-life considerations, “Do-Not-Resuscitate” orders, when to switch to palliative care, last will and testament decisions, residential care facility or in-home care, burial or cremation? Working through these, though not easy, can alleviate a lot of stress for yourself and more importantly for your family. With this in mind, perhaps a long conversation with your spouse and a notepad would be a great way to make some headway. So, how are you doing on your policy letters?